Bilderberg.org :: View topic - Sat 22 Sept 2018, OOSTERBEEK, The Traitors of Arnhem? 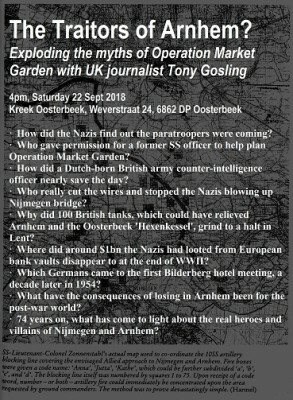 Sat 22 Sept 2018, OOSTERBEEK, The Traitors of Arnhem? Bilderberg.org Forum Index -> Bilderberg Conference 2019 - Ottawa - Wed 15th to Sun 19th May - Brook St Hotel, Ottawa West? Posted: Tue Aug 21, 2018 9:44 am Post subject: Sat 22 Sept 2018, OOSTERBEEK, The Traitors of Arnhem? How did the Nazis find out the paratroopers were coming? Who gave permission for a former SS officer to help plan Operation Market Garden? How did a Dutch-born British army counter-intelligence officer nearly save the day? Who really cut the wires and stopped the Nazis blowing up Nijmegen bridge? Why did 100 British tanks, which could have relieved Arnhem and the Oosterbeek 'Hexenkessel', grind to a halt in Lent? Where did around $1bn the Nazis had looted from European bank vaults disappear to at the end of WWII? Which Germans came to the first Bilderberg hotel meeting a decade later in 1954? What have the consequences of losing in Arnhem been for the post-war world? 74 years on, what has come to light about the real heroes and villains of Nijmegen and Arnhem? Winston Churchill said "In wartime, truth is so precious that she should always be attended by a bodyguard of lies." For seventy five years we have been taught Operation Market Garden, British commander Montgomery's plan to liberate Holland, was a badly conceived mission, doomed to fail. British journalist Tony Gosling begs to differ, he believes the battle of Arnhem was deliberately sabotaged to prolong the war on the Western front, by treacherous anti-Soviet elements in the British Establishment. Around 80,000 allied soldiers and airmen took part in what is still the biggest airborne operation in history. The consequences were catastrophic for the allied armed forces but worse for the Dutch civilian population. In the subsequent 'Hongerwinter', after the Germans cut off all food supplies to the Arnhem region, an estimated 22,000 Dutch civilians were starved to death. The week-long battle resulted in around 2,500 dead soldiers on each side, roughly 7,000 German and 15,000 allied casualties in total, while 6,500 British paratroopers were taken prisoner. In this audio-visual seminar the former BBC journalist will present evidence that, after August 1944, senior collaborators within the British state were doing secret deals with high-ranking Nazis for enriched uranium, gold and money, in exchange for safe passage and new identities after the war. He goes on to explain how two key figures who made decisive 'blunders' at Operation Market Garden were rewarded with top jobs after the war in political lobbying for corporate cartels, the EEC, eventually the EU and Euro currency too, in the NATO countries. The Oosterbeek-founded Bilderberg lobby Bernhard and Carrington chaired were also accused in 2010, by Italy's most senior judge, Ferdinando Imposimato, of working for international organised crime. Of using far right agents in the NATO intelligence structures to kill hundreds of European citizens in 'Gladio' terrorist attacks, from the 1970s to 1990s, which they tried to blame on Moscow. We will hear from other speakers about the September 1944 battle, the subsequent Bilderberg conferences and the lessons to learn for the anti-war movement today. Then, after 'the Grenadier Guards Lent tea break', it's 'open mic', where anyone who wishes to can give a contribution on Market Garden, Bilderberg and related topics for up to ten minutes. We close at 1900. The entire seminar will be filmed and we hope to make it available afterwards online. 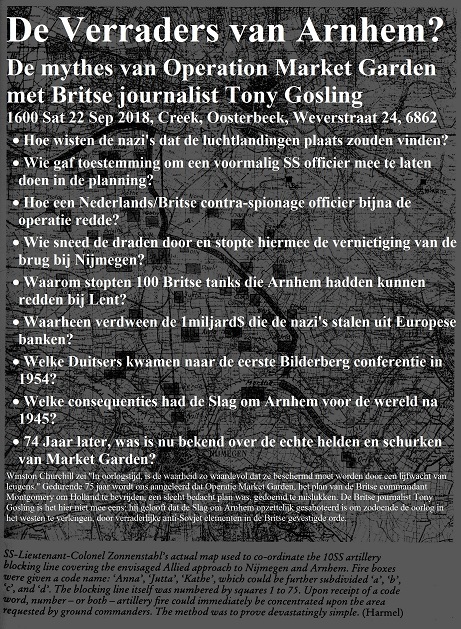 Former BBC journalist Tony Gosling is in Gelderland, on the Island, to do a live radio broadcast to the UK and a talk at 4pm on Saturday afternoon in Oosterbeek about the battle of Arnhem, and implications today. Most historians talk about the battle as an 'epic failure', celebrating the courage of the paratroopers 'against all odds'. But what few mention was that those odds were loaded less by the Nazis, than by elements within the Allied High command. The question is, why? A mystery which is one of the reasons thousands come to commemorate events year after year. Operation Market Garden took place shortly after the notorious 'Red House Meeting, in Strasbourg' where Nazi industrialists finalised deals they were cutting with the Allied establishment for them and their industries to survive and benefit once war was over. The Battles of Arnhem and Nijmegen are an historian's 'goldmine' because, even 74 years after the battle, evidence is still emerging about what went wrong and right back in September 1944. Tony will present some of the latest evidence of the foreknowledge German Field Marshal Model had of the drops, which enabled him to place 'reserve' SS battle groups near Arnhem well beforehand. He will look at the link between the battle and Prince Bernhard's historic 'Bilderberg meetings' which began ten years after the end of the war in Oosterbeek, the same pocket where the British paratroopers were isolated. Also evidence which emerged last year of Nazi nuclear tests which prove Germans had enriched uranium, an important bargaining chip as the war drew to a close. Some in the Allied high command were clearly paying more attention to feathering their own nests after the war than any kind of 'race to Berlin'. Tony will look at evidence of 'secret deals' between Hitler's treasurer Martin Bormann, who some say died outside the Führerbunker at the end of the war, and Churchill's private secretary and 'man of mystery' Major Desmond Morton, for around a billion dollars of Nazi loot. Tony will also air recordings of exclusive interviews with some of the soldiers who were in Nijmegen and Arnhem, which point not to flaws in Montgomery's plan, but incompetence at the top of the British Army verging on treachery. The result has been a modern world where the far right is again on the rise in Europe, in Ukraine too, where Cold War hatred of Moscow is being rekindled, and where Hitler's Swiss banking financiers are again working against the interests of ordinary Europeans. Tony Gosling worked as a BBC radio journalist in London, and Salisbury, Wiltshire. For the last ten years he has presented a weekly Politics Show in Bristol, UK, with Oxford Economist Martin Summers. Most historians talk about the battle as an ‘epic failure’, celebrating the courage of the paratroopers ‘against all odds’. But what few mention was that those odds were loaded less by the Nazis, than by elements within the Allied High command. The question is, why? A mystery which is one of the reasons thousands come to commemorate events year after year.